Truckee freshman Olivia Koster competes in the hurdles at the Northwest Invitational at McQueen High School on Saturday. Truckee will compete in the Fallon Elks Invitational on Saturday. 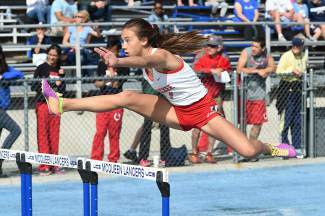 In the first large-scale meet of the season, the Truckee track and field team fared well against its Division I competition, smashing two meet records on the girls side and showing dominance in relays among both the boys and the girls teams. The Northwest Invitational at McQueen High School included 20 teams from across Northern Nevada, the majority of which were DI. Most events included more than 50 entrants. While McQueen dominated the final tally, easily winning both the boys and girls competitions, Truckee’s girls placed seventh overall and second among D-IA teams, losing by 5.5 points to Spring Creek, 58.5 to 53. Truckee boys placed 16th overall and sixth among D-IA teams, but just one point behind both Sparks and South Tahoe, who tied for fourth. Senior standouts Gabrielle Rinne and Skyler Flora broke Northwest Invitational meet records in their respective signature events. Rinne broke her own meet record set in 2013 in the 800-meter run by nearly 3 seconds, in 2:16.54. Flora set a new meet record in the 3,000 with a time of 10:45.90, breaking Elko’s MaryJo Wright’s 2012 mark of 10:48.41. The boys 4 x 400 relay team of Eli Yale, Colin Deurlington, Carson Cottel and Tanner Sawyer placed third with a time of 3:38.77 in the field of 21 teams. Only DI powerhouses Damonte and McQueen bested their impressive early-season time. As the defending D-IA state champions in the 4 x 400, the Truckee girls were able to field two highly competitive relay teams in the event, placing second and fourth, to McQueen’s first place and Reno’s third place. Truckee’s second-place team of Olivia Yale, Emma Warren, Sophie Curtis and Heather Pendleton finished in 4:16.30, while the fourth-place team of Rinne, Claire Lang-Ree, Izzy Abarno and Julia Veliquette finished in 4:21.79. “Our relays looked really solid when sized up against DI, and we’re getting a clearer idea of who those relay members will be,” coach Yale said. Other top finishes among the boys team included senior Noah Oberriter placing fifth in the 3,000 (9:28.7) and eighth in the 1,500 (4:22.08). Gabe Deiro registered a 20th-place finish in the 100 (11.96) in a field of 71 runners. In the 400, Deurlington placed 10th (53.44), Sawyer 15th (53.89) and Yale 18th (54.48). In field events, standouts included Deiro’s 26th-place throw (36-04) in the shot put among 76 competitors. Fellow senior Baldo Ramirez placed 29th in a field of 79 in the discus (103-11). Another senior, Eli Delaunay, earned top results in jumps: 23rd in the long jump (17-09.50) and 20th in the triple jump (34-01.50). Other top finishes among the girls were Yale’s eighth place in the 200 (28.36), Hailey Matosian’s 10th in the 400 (66.90), Warren’s eighth in the 800 (2:35.63), LangRee’s 10th in the 800 (2:36.21), Rinne’s third in the 3,000 (11:16.3), and Olivia Koster’s eighth in the 100 hurdles (18.29). In field events, top finishes for the girls included Chloe Wall’s fifth place in the pole vault ( 9-00), Hayley Thomas’s sixth in the triple jump (31-00) and Pendleton’s eighth in the high jump (4-08). The day before the Northwest Invitational, Truckee’s younger athletes competed at the Raider JV Invitational at Reed High School. In a slightly smaller field of 10 mostly DI schools, the boys team placed fourth overall and second among D-IA schools, just 1.5 points behind Sparks. The girls placed second overall, losing only to host Reed. Go to http://www.athletic.net for complete results from both meets.